After disappointing ‘groundbreaking’ results in the first two months of 2019, March delivered a solidly upbeat change. ConstructConnect announced today that the latest month’s volume of construction starts, excluding residential work, was $35.0 billion (green shaded box, Table 3 below), an increase of +42.6% versus February, and way above the usual gain as winter makes way for spring. Much of the credit for the surge in starts, month-to-month, goes to initiations of work on several projects with estimated values higher than a billion dollars each (See Top 10 Project Starts in the U.S. – March 2019.). While the four recent mega project start-ups helped in March’s comparison with February, they still couldn’t lift March 2019 enough to match the same month of last year, which included a $5.5 billion pipeline project. March 2019 nonresidential starts relative to March 2018 were -16.5%. This latest month, however, was quite close to the ‘norm’ for March in the preceding five years. Compared with the average for March from 2014 through 2018, March 2019 underperformed only slightly, -1.7%. Year-to-date nonresidential starts are now -14.1% compared with the same period of last year (i.e., Q1 2019 versus Q1 2018). Since large project initiations can often introduce notable volatility in the monthly ‘starts’ numbers and their period-to-period percentage changes, it is informative to also study ‘smoothed’ series, such as are set out in the middle columns of Table 4 below. On a 12-month moving average basis, March 2019’s total nonresidential starts were -0.5% compared with the previous 12 months (i.e., April 2018-to-March 2019 vs April 2017-to-March 2018). Type-of-structure subcategory starts on the same 12-month moving average basis in March 2019 were: commercial, -5.5; industrial, +22.2%; institutional, -1.1%; and engineering, +0.2%. The ‘starts’ figures appearing in this report’s tables and graphs are not seasonally adjusted (NSA). Nor are they altered for inflation. They are expressed in what are termed ‘current’ as opposed to ‘constant’ dollars. ‘Nonresidential building’ plus ‘engineering/civil’ work accounts for a larger share of total construction than residential activity. The former’s combined proportion of total put-in-place construction in the Census Bureau’s latest report, for February, was 59%; the latter’s share was 41%. ConstructConnect’s construction starts are leading indicators for the Census Bureau’s capital investment or put-in-place series. Also, the reporting period for starts (March 2019) is one month ahead of the reporting period for the investment series (February 2019). According to the latest Employment Situation report from the Bureau of Labor Statistics (BLS), the U.S. construction sector’s record of employment in the first three months of this year has been varied to say the least: +56,000 jobs in January; -25,000 in February; and +16,000 in March. The monthly average of ‘hard hat’ hiring through the first quarter of this year was +16,000, down by more than half versus the +36,000 figure for Q1 of last year. Construction has re-taken top spot for fastest year-over-year growth in employment among major industrial sectors. Its +3.4% in March edged out transportation and warehousing’s +3.3%. Also, construction added to payrolls at twice the speed of manufacturing (+1.7%). 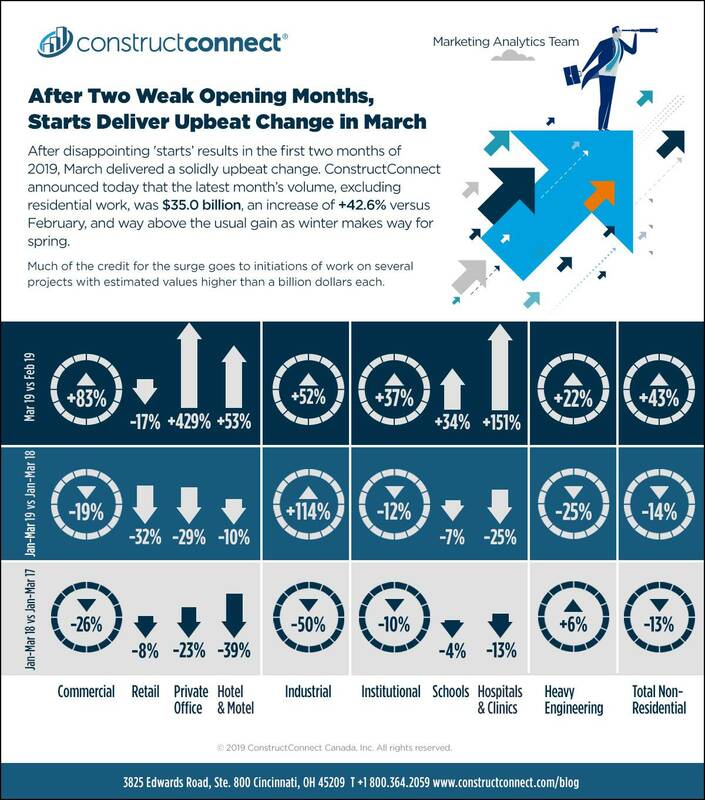 The sizable m/m leap upwards of +42.6% in total nonresidential starts in March was led by commercial, +83.3%, with all the other subcategories also showing good gains: industrial, +52.1%; institutional, +37.4%; and heavy engineering/civil, +21.5%. March 2019’s y/y total nonresidential starts decline of -16.5% (i.e., versus March 2018) originated in the engineering (-44.4%) and institutional (-12.0%) subcategories, as commercial (+13.6%), and to a greater extent, industrial (+184.5%), both beat their year-prior performances. The latest month’s total nonresidential starts drop year to date (ytd) of -14.1% was due to engineering (-25.0%), commercial (-18.9%) and institutional (-11.5%) pullbacks that were not fully compensated by industrial’s level more than doubling (+113.7%). ‘Road/highway’ starts have accounted for the largest share (39%) of engineering work so far this year. Street starts in March 2019 were -26.6% y/y and -11.7% ytd, but +47.9% m/m. ‘Water/sewage’ and ‘bridge’ starts have made up the second and third largest slices of engineering starts to-date in 2019 (22% and 19% respectively). The former, in the latest month, was -3.8% y/y and -0.3% m/m, but +1.1% ytd; the latter was -37.7% y/y, -31.0% m/m and -10.3% ytd. ‘Private office building’ starts have constituted a quarter of commercial starts so far this year. In March, extra office space starts were -28.9% ytd, but +135.0% y/y and +429.4% m/m. As set out in the Top 10 list, a $2.5 billion data center in Georgia provided a great deal of lift to private office space starts in March. ‘Hotel/motel’ starts were one-fifth of commercial starts in Q1. Accommodation’s percentage change numbers in March were -9.7% ytd, but +29.1% y/y and +53.4% m/m. ‘Warehouse’ and ‘retail/shopping’ accounted for nearly equal third- and fourth-place shares of commercial in Q1 (14% and 13% respectively). ‘Retail/shopping’ in March was down across the board: -46.6% y/y; -32.3% ytd; and -16.5% m/m. ‘Warehouse’ was a little better: -22.4% ytd; -18.0% y/y; but +27.3% m/m. With a 58% share of institutional, ‘school/college’ starts were a dominant force in Q1. In March, educational facility groundbreakings were -18.6% y/y and -7.3% ytd, but +34.2% m/m. ‘Medical facility’ starts, as a combination of ‘hospitals/clinics’, ‘nursing/assisted living’ and ‘miscellaneous medical’, were about one-quarter (24%) of institutional in Q1. The broad medical category metrics in March were -24.6% ytd and -5.5% y/y, but +38.6% m/m. As a subset, ‘hospital/clinic’ starts in the latest month were -24.8% ytd, but +50.8% y/y and +151.4% m/m. The Nonresidential Construction Starts Trend Graphs – March 2019 sets out 12-month moving average trend graphs for key type-of-structure categories. Many of the curves have been flattening out of late, although ‘retail’ continues to descend dramatically. The big plunge in ‘miscellaneous civil’ starts in the latest month was because March 2018’s multi-billion-dollar pipeline project has just dropped out of the moving 12-month average calculation. Tables B-3 and B-8 of the monthly Employment Situation report record average hourly and average weekly wages for industry sectors. B-3 is for all employees (i.e., including bosses) on nonfarm payrolls; B-8 is for ‘production and nonsupervisory personnel’ only (i.e., it excludes bosses). For ‘all jobs’ and construction, there are eight relevant percentage changes to consider. In March, the eight percentage changes were all spaced in a remarkably narrow range from +3.0% to +3.6%. There have been improvements in compensation over the past couple of years, but the progress has been slow and construction workers have fared neither worse nor better than their compatriots throughout the labor force. Job openings Graph 1 below, derived from the Census Bureau’s JOLTS report, highlights why the inertia in wage gains is surprising. Job openings, as both a level and a rate, are at historical highs. Meanwhile, the construction ‘hires’ level (Graph 2), from the same JOLTS report, is barely on an incline, while the construction ‘hires’ rate continues to be flat. Reducing the gap between ‘openings’ and ‘hires’ may soon require heftier monetary incentives. *Rate is number of job openings end-of-month as % of ‘construction employment plus number of job openings’. Job Openings and Labor Turnover Survey. Latest seasonally adjusted (SA) data points are for Feb. 2019. *Rate is number of hires during month as % of construction employment. Further on costing, March 2019’s y/y results for three BLS Producer Price Index (PPI) series were: ‘construction materials special index’, +3.1% (down from +4.2% in February); ‘inputs to new construction index, excluding capital investment, labor and imports’, +2.7% (up from +2.4% in February); and ‘final demand construction’, +4.9% (about even with +4.8% in February). The value of construction starts each month is summarized from ConstructConnect’s database of all active construction projects in the U.S. Missing project values are estimated with the help of RSMeans’ building cost models. ConstructConnect’s nonresidential construction starts series, because it is comprised of total-value estimates for individual projects, some of which are ultra-large, has a history of being more volatile than many other leading indicators for the economy. ConstructConnect’s total residential starts (i.e., single-family plus multi-family starts) in the latest month were +18.8% m/m; -9.4% y/y and -10.4% ytd. (The multi-family market so far in 2019, at -28.2% ytd, has fallen into a bigger pothole than the single-family market, -2.5% ytd). ‘Grand total’ construction starts in March were +32.3% m/m; -13.9% y/y and -12.7% ytd. ConstructConnect has moved to a better-targeted and research-assigned ‘start’ date. (Prior to January 2017, the ‘start’ date was recorded as occurring within 30 to 60 days of the announced bid date.) In concept, a ‘start’ is equivalent to ground being broken for a project to proceed. If work is abandoned or re-bid, the ‘start’ date is revised to reflect the new information. Click here to download the Construction Industry Snapshot Package – March 2019 PDF. Click here for the Top 10 Project Starts in the U.S. – March 2019. 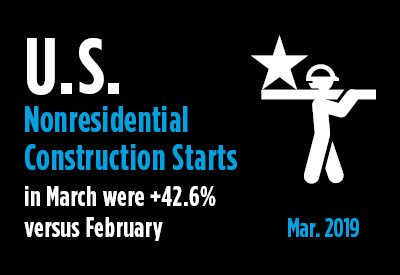 Click here for the Nonresidential Construction Starts Trend Graphs – March 2019. *Includes transportation terminals and sports arenas. Source: ConstructConnect Research Group and ConstructConnect. Table 1 conforms to the type-of-structure ordering adopted by many firms and organizations in the industry. Specifically, it breaks nonresidential building into ICI work (i.e., industrial, commercial and institutional), since each has its own set of economic and demographic drivers. Table 2 presents an alternative, perhaps more user-friendly and intuitive type-of-structure ordering that matches how the data appears in ConstructConnect’s online product ‘Insight’. Latest month actuals Moving averages (placed in end month) Year to Date. *Figures above are comprised of nonres building and engineering (i.e., residential is omitted).